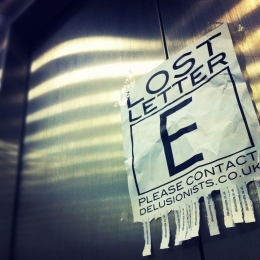 Elevator Music is the second release in Delusionists new Lost Letters series, and it’s available to stream/download for free HERE. You can also get involved with discovering the next Lost Letter by printing off this poster and posting it somewhere for all to see. Take a photo of wherever you post it and send it to lostletters@delusionists.co.uk and if it’s funny/provocative/beautiful they might just use your image as the cover art for the next release. Submissions need to reach by Saturday 22nd October and should be an exact square of at least 520×520 pixels (the bigger, the better) with the main text on the poster clearly visible. This entry was posted on October 18, 2011 at 8:19 am and is filed under Delusionists with tags Ben Black, Delusionists, Lost Letters, UK Hip-Hop. You can follow any responses to this entry through the RSS 2.0 feed. You can leave a response, or trackback from your own site.